Social inequality and social disadvantage provide an all too fertile soil that sustains the majority of the serious mental health problems suffered by children in our society. The complexity of the issues clinicians routinely encounter in working with children with mental health problems is widely acknowledged. However, few books concern themselves with how such difficult populations can be effectively approached and the strategies that are likely to deliver effective treatment to them. This book, based on a highly successful seminar for grant-giving children's charities held at the Anna Freud Centre and sponsored by John Lyon's Charity, provides pragmatic solutions to this major therapeutic challenge of our age. The chapters bridge statutory and voluntary initiatives and are held firmly together by the commitment to evidence-based, systematically offered, programmatic and innovative approaches that can help those who, although hard to reach, are in greatest need of our efforts: the socially excluded children and families in our society. As such, this book will be invaluable to psychologists, psychotherapists, counselors and family therapists. Geoffrey Baruch is Director of the Brandon Centre for Counseling and Psychotherapy for Young People (the Brandon Centre) in Kentish Town, London. He is a member of the British Psychoanalytical Society, and is Qualified in the Treatment of adults and as a child psychoanalyst. He is the lead investigator for the first randomized controlled trial of multisystemic therapy in the UK. Between 2001 and 2003 he was a senior policy adviser to the child and adolescent mental health team, Department of Health, contributing to the National Service Framework for Children, Young People and Maternity Services. Peter Fonagy, PhD, FBA is Freud Memorial Professor of Psychoanalysis and Director of the Sub-Department of Clinical Health Psychology at University College London. He is also Chief Executive of the Anna Freud Centre, London, and is a Consultant for the Child and Family Program at the Menninger Department of Psychiatry, Baylor College of Medicine. He is a clinical psychologist, and both a training and supervising analyst in child and adult analysis for the British Psychoanalytical Society. He holds a number of important positions, which include co-chairing the research committee of the International Psychoanalytic Association, and Fellowship of the British Academy. He has published over 300 chapters and articles and has authored or edited several books. 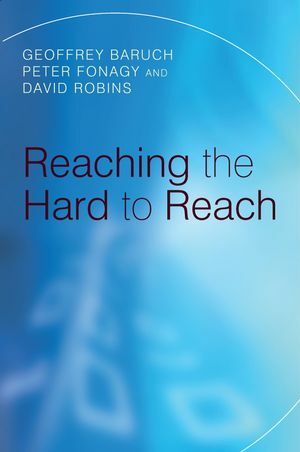 David Robins, MPhil is the Director of Grand Giving at John Lyon's Charity, and the author of a number of studies of disaffected and marginalized young people including Tarnished Vision: Crime and Conflict in the Inner City (OUP 1992). Foreword by Professor Michael Edwards. Part I: Policy and Research Background to Working with the Hard to Reach. 1 The early social and emotional determinants of inequalities in health. (Peter Fonagy and Anna Higgitt). 2 What evidence for evidence-based prevention? (Peter Fonagy). 3 Overview of child and adolescent mental health policy and service provision in England: Attempts to reach the hard to reach. (Miranda Wolpert, Paula Lavis, Richard Wistow and Bob Foster). Part II: Specific Intervention Programmes Working with the Hard to Reach. 4 A study of multisystemic therapy: A new type of help in the UK for young people in trouble with the law. (Geoffrey Baruch and Jacqueline Cannon). 5 Barefoot practitioners: A proposal for a manualized, home-based, adolescent crisis intervention project. (Eia Asen and Dickon Bevington). 6 Developing an enhanced care model for depression using primary care mental health workers: Implications for the care and management of young men with depression. (Stephen Pilling, Judy Leibowitz, John Cape, Jemma Simmons, Pamela Jacobsen and Irwin Nazareth). 7 The hard to reach and the Place2Be. (Peter Wilson and Benita Refson).